Hi, my name is Archie, in October 2010 I was diagnosed with an extremely rare form of Anaemia, known as Congenital Sideroblastic Anaemia. Since this time I’ve undergone extensive treatment to ascertain the exact cause behind my illness. I receive regular blood transfusions to stay alive! So if you can donate blood I would much appreciate it. Give blood.. 96% of us rely on the other 4% to give blood. Please don’t leave it to someone else. To provide a knowledge base for those in similar situations, and provide access to necessary links, which promotes self-help and guidance on how and where to find support. When I started this journey, my parents were thrown in the deep end and had a very steep learning curve. My aim is to provide resources to make it easier to understand exactly how this condition is managed. I shall also list any connections I’ve had contact with, including a list of events my dear friends and parents have taken part in, to raise money to help those who’ve helped me. Sideroblastic anaemia or sideroachrestic anaemia is a disease in which the bone marrow produces ringed sideroblasts rather than healthy red blood cells (erythrocytes). It may be caused either by a genetic disorder or indirectly as part of myelodysplastic syndrome, which can evolve into hematological malignancies (especially acute myelogenous leukemia). In sideroblastic anemia, the body has iron available but cannot incorporate it into hemoglobin, which red blood cells need to transport oxygen efficiently. Symptoms of sideroblastic anemia include skin paleness, fatigue, dizziness, and enlarged spleen and liver. Heart disease, liver damage, and kidney failure can result from iron buildup in these organs. Occasionally, the anaemia is so severe that support with transfusion is required. These patients usually do not respond to erythropoietin therapy. Some cases have been reported that the anaemia is reversed or heme level is improved through use of moderate to high doses of pyrodoxine (Vitamin B6). In severe cases of SBA, bone marrow transplant is also an option with limited information about the success rate. Some cases are listed on MedLine and various other medical sites. In the case of isoniazid-induced sideroblastic anaemia, the addition of B6 is sufficient to correct the anemia. Desferrioxamine is used to treat iron overload from transfusions. Bone Marrow Transplant (BMT) is the last possible treatment. 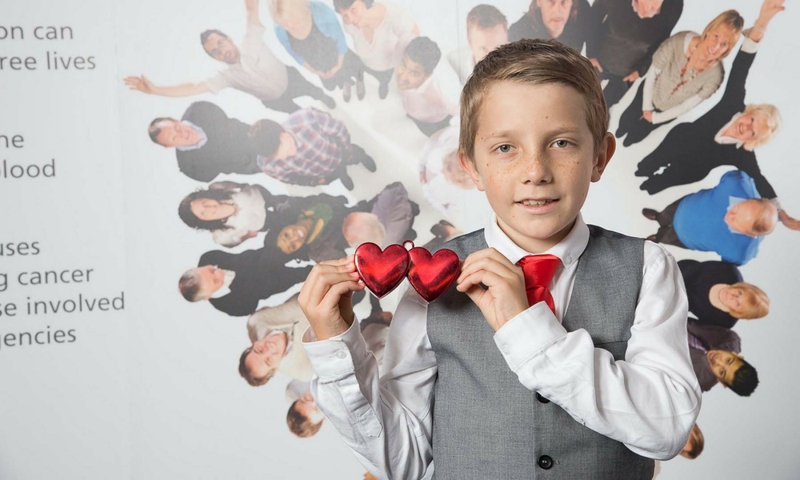 Below – Archie featuring in a Give Blood campaign.